The great realized sages and spiritual masters are a mysterious blend of the highest spiritual wisdom together with profound humility. Though Swamiji guides and inspires hundreds of seekers along the spiritual path, he never considers himself a teacher, or preacher of one particular path or yoga. Nevertheless, when sincere seekers approach him for his help and guidance, he does not hesitate to give very precise guidance on spiritual matters and methods of spiritual practice. The divine wisdom which flows from him at such times has been compiled and published in the form of several books (see Publications). In general Swamiji encourages aspirants to follow an integral approach to sadhana, utilizing the power of devotion, knowledge and action together on the path of God-Realization. Often he recommends the practice of mantra japa or the repetition of a holy name of God as one of the easiest methods to remember and realize the Divine in this day and age. He also stresses the importance of prayer, which helps to make the seeker more humble, open and receptive to the grace of God which is ever available to all. For those interested in the path of knowledge or Advaita, Swamiji guides them according to the ancient Vedantic teachings and sometimes prescribes a method of meditation such as the witnessing technique. Having himself practised various methods of meditation during his sadhana days, integrating both devotion to God, scriptural study and the highest non-dual experience of Advaita Vedanta, Swamiji thus guides people according to his own direct experience as well as the individual temperament of the seeker. Given below is a collection of Swamiji's quotations on various spiritual topics, followed by a brief overview of the practical advice Swamiji often gives for following a well-balanced and all-inclusive spiritual practice, which he often calls Integral Sadhana. It should be remembered that while writing in English, Swamiji uses the word God for all the aspects of the Absolute Divine Reality (Brahman), whereas in Sanskrit and Hindi different names are used for different aspects of the Divine. "The true aim and purpose of human life is Self-Realization, the Realization of the Absolute Life, Absolute Consciousness, Absolute Bliss, Absolute Love. This Realization happens when and where the total self-effort on the part of the seeker and the unreserved Grace on the part of the Divine meet." "We are potentially Divine. We have to manifest this divinity through spiritual sadhana. The purpose of all spiritual effort is to purify the mind and stabilize it so that it can reflect the divine Light, which is already there. The mind is like a mirror. If the mirror is dirty and moving, you cannot see your face, as it is, in that mirror. Similarly, it is only in the pure, calm and silent mind that the Truth or God is revealed." "What am I seeking? This is the most fundamental question which everyone should ask himself or herself. It is God/Self, and Self alone, the Absolute Bliss/Consciousness, which is truly attainable and which once realised, is never lost. All else is like a mirage, which can never quench the thirst of anyone." "God is there in your every action, conscious or subconscious. He is the Life of your life, the Mind of your mind, the Eye of your eye and so on. He is never away from you. Nor can you ever forget Him. You only mistake Him. How can you forget Consciousness? How can you forget Bliss? God is absolute Consciousness, Absolute Existence, Absolute Bliss. Every human being is consciously or unconsciously searching for it and trying to realize it. But due to ignorance people seek it in the transitory worldly things and relationships, and therefore do not find it. How can the infinite and unlimited Bliss be realized in the limited and finite things, situations and relationships?" "The relationship between the soul and God is like the relationship between a child and its mother. The child may be playing with toys for a long time, but a time comes when it wants to go back home and meet its mother. The toys with which we play in life are changing with the change in our level of consciousness. And a time comes when we throw away all the toys, stop playing with toys and want to go back to God, from where we have come. God is our real Home, our real Country, our real Source and Existence. We are, as it were, in exile at present — that is why we are suffering." "God is the ground of all existence. The names and forms change, but the substance, the substratum which supports all names and forms is Consciousness or 'Isness.' "
"You have not only to love God, but to love only God. Every breath, every thought, every action, every emotion must be transformed into sadhana, into the remembrance of God. Only then one can Realize God. That is the price of God-Realization. Nothing less than that can work for God-Realization." "The single most important qualification for a seeker of Truth is a deep and sincere aspiration to realize the Truth, as a hungry person longs for food and a thirsty person longs for water. Such should be the intensity of need for God-Realization." "God-Realization is the Realization of the supreme Self that is free from all limitations of time, space and causality. God-Realization makes you totally free and blissful." "When you want something other than you, it is ‘desire’. But to aspire for Self-Realization or God-Realization is not a desire. It is your birthright." "For God-Realization there are so many paths. Broadly they have been classified into three paths — bhakti yoga, the path of devotion, karma yoga, the path of selfless service in the name of God, and jnana yoga, the path of knowledge. The moral and social discipline, which involves self-control — control over one’s thoughts, emotions and desires — is almost the same in all these paths. We should practise meditation and prayer with sincerity and commitment if we want God-Realization or Self-Realization." "The purpose of all spiritual practices is to purify the mind and make it stable and unmoving. It is in the completely silent and alert mind that revelation happens. Love for God also purifies the mind and stops it from moving; ultimately it unites the lover with the beloved, the Divine." "Sadhana implies spiritual effort for God-Realization, a sort of movement towards the Divine, which involves energy — physical, mental, vital, etc. All the energies move in wave form, that is going up, coming down, again going up and moving down — like the movement of prana in inhaling and exhaling. So the ups and downs are necessary in sadhana, but the intensity and depth of the sadhana can be maintained by balanced, proper and right effort — that is, not going to the extremes." "The more you progress on the spiritual path, the more your happiness depends on yourself, and not on any changeable situation. The criterion of progress on the spiritual path is that your inner detachment towards what is temporal and your love for the Divine are becoming deeper and stronger." "All practices of remembering God are to fall in love with God. When you really fall in deep love with God, you will be able to remember God all day long, in all daily activities, and even in your dreams. A lover spontaneously, without any effort or practice, remembers his/her beloved all the time. Let God and God alone be your Beloved!" "As the physical body requires a balanced quantity of vitamins, minerals, proteins, etc. for its good health and growth, similarly a person needs a balanced sadhana for his/ her spiritual health and growth. 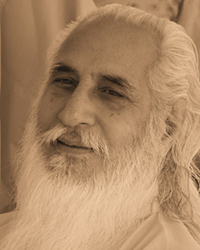 Japa, meditation, reading and reflecting on the revealed scriptures, the company of sincere seekers of Truth/ God/ Nirvana, associating with enlightened sages and saints, selfless service to the poor and needy in the name of God and sankirtan or singing the holy names and glories of God are the ingredients which make a balanced and integral sadhana." Sit in meditation daily and regularly at least in the early morning and evening. Meditation is food for the soul as bread, fruits and vegetables are food for the physical body. Remember God through the practice of japa — repeating the holy name of God in which you have faith and devotion. The practice of japa is a very scientific method of stilling the mind and purifying the subconscious. Pray to the Divine for dispassion, clarity of vision and light of awareness. What cannot be achieved by self-effort can surely be achieved through prayer. Serve the poor and needy in the name of God. Serve the saints and sages who have realized God or are deeply devoted to God. Associate with saints and sages from whom you gain inspiration and avoid the company of those who don't believe in spiritual and moral values. Read and reflect on the revealed holy scriptures. Read the biographies of great saints and sages and spiritual books which intensify your aspiration to follow the path and practise sadhana. Practise self-control over your mind and senses. Practise some breathing exercises which make your breathing process light, slow, rhythmic and deep. Be patient. It can take many years, even many lives to gain complete control over one’s mind. Regular practice and very deep interest are a must in spiritual sadhana, as is the spirit of perseverance. Reflect again and again on the transient nature of the objects, situations, and relationships of this world. Reflect on death again and again. It is a way to develop the spirit of vairagya from the world of name and form. Vairagya or inner detachment from the world of name and form is an essential prerequisite of going deep into one's timeless and immortal, real Being. Discharge your familial and social duties in the name of God. Love and serve your parents and give them proper respect. Have less and less worldly desires. Avoid and give up all bad habits. Live a very simple and honest life. Live your life for the direct experience of God.